This is an excellent game with no IAPs, time gates, etc. The only drawback for me is that the income does not change while you're not in the app, so you need to sit there with the game open if you need to save up revenue. Just when I thought I discovered everything this game had to offer, I was delighted by new features which unlocked as I leveled up. This is an outstanding and remarkable game from a one-man studio. Please keep the updates coming. This game is amazing and I love the idea that you pay a one time fee and just get to play the game no ads or in store purchases necessary. All I will say is that it would be nice if they could update it more and more and just add color building and a wider variety. It’s kinda boring as of now but they could so easily do an update and make the game better! Great game. I wish it had more content, but for the price I’m not going to complain. One of my favorite iOS games. I was scared to pay for it, but I was wrong! Is game scared me a little, I was afraid I was going to pay for a game like The Sims, I was wrong! It is really fun and you don’t need to pay for any money in this, I exclusively like that there is a sandbox mode. My only Issue is after a couple days of having this game, It gets boring. Great game to relax and play. No in app purchases. No annoying ads. Most building games take too much time to do. This is a simple fun game. It’s actively worked on and updated with new additions. Some areas need more depth to make it more challenging but it’s a fun game to build a city. It’s basically the original SimCity. Easy to get into and play! This game is really fun!!! But it needs more buildings and it needs more land to build on. It’s super fun and easy though, I really like it! GREAT! Until the finances go off a cliff. This is a very well thought out game. I have tried many different ones and this one is by far the best. The logic is straight forward. the performance is smooth. The animation is good. No need for in game purchase. No waiting for things to develop. Just play. Easy breezy. Thank you for making a game with no in app purchases. Outrageous wait times and silly ways to wait or pay to get around them! This is what the gaming industry needs to be. Just pure, quality, fun and worth buying games. Thank you for not following the dull, non creative and greedy way of every other city building game! It’s because of developers like you I enjoy playing games on my iPhone. I really love this game. Also. I like the natural disasters and crimes. So, whenever I try to increase my city’s recreation rating, it always nags me that there isn’t a recreation view to help me. If you added a recreation view, it would show where there is entertainment, and where there isn’t. Also, you should add a fire safety view (which would show which parts of your city are close-ish to fire departments) , and alter the crime view to also show what parts of the city are safe from crime. Been playing for a few days, easy to lose track of time building a city. Much more comfortable than other games heavy on the IAP’s. I would give five stars, but the scaling is a bit distracting. The stadium and airport are 2x2 tiles, the same as most other properties, but I think they should be bigger. It would be more fun if different types of buildings/businesses occupied more relative space to their scaled size. Fun but only for a short while. Cool game for a good hour. After that. Things just seem bland and boring. A mobile game that’s actually worth the money?! Beats out the Sims City games, and it’s pretty much FTP (except for when you first buy it of course). The game has some room for improvement still, but it’s enjoyable and keeps me busy! Fun game and no micro transactions or loot boxes. Great simple gameplay. Would love to be able to further level my zones! Want even more buildings! I love the game but. The game is overall pretty fun, but once you unlock and do everything there is to do... there’s nothing else. You end up just restarting and repeating the same thing over and over again to achieve the same goal. I really liked this game although now that I’m at 76 level I don’t find this game exciting no more because the building don’t go much higher unlike other city stimulation games! Once you build something and upgraded the zone the buildings stay the same no matter how much growth you experience!! This game is really cool. It isn’t a forced in app purchase game, you spend the initial cost and the game doesn’t force you to buy extra in app purchases like most sim city building games available in the App Store. I applaud that. However it still leaves more to be desired from game play. It’s not quite as organic as sim city, as they only have one type of land building option for each city type. Example: there are commercial, residential and industrial zones. However they don’t have population density options like sim city. I’ve maxed my city out in construction but the population is under 20,000. Another way it is less organic is there aren’t ordinances and laws you can put in place. Ordinances can change the game play and make it much more interactive and less sandbox city builder and more being a mayor. The advisors don’t give you real goals or questions they are more like simple milestones or silly games. Its like a more childish version of sim city. Overall this game is fun! It’s not nearly as much to do and freedom as the original sim city on PC and earlier generations iPhones/androids. That has since been removed from App Store. But it is a fun game and the best city builder I’ve played on the App Store in years. This is a great game and lets me enjoy the feel of the early version of SimCity. I also love the fact I can buy the game and then progress through the levels without being trapped into paying for upgrades. Kudos to the developer! Thoroughly enjoyed this game for about 2 days but once you finish your first or second city it gets a bit boring. Lots of fun but if they added more specific quest or achievements that would definitely add replay ability. I love how I paid once and got the full game. I’m so tired of the continual, pay forever schemes. Anyway, the games progression is pretty fast. I think I maxed out my city in a few days. My only issue is I initially made too many banks and I was earning a buku amount of money per “month”. Now I’m having to redo my whole city because I’ve run out of space and I keep having to get rid of more stuff. I NEED MORE SPACE!!! This game is greatly addictive, I can’t stop playing it, it’s so fun and I’m sure anyone would like it! For a game to keep me (40+) and my daughter (10+) entertained means they go something totally right. Best $3.99 ever spent...! This game was fun at first with a nice interface and reasonably entertaining quests. But it became drudgery after about 4 hours of play with very little left to do. I was disappointed it didn’t support landscape mode on my iPad. I love this game and everything about it. It will never be deleted. The only things I want are bigger spaces to add to your city, bigger oceans, more natural disasters, and more buildings. Purchase is worth it, 5 stars! Compared to the annoying, IAP flooded city games right now, for $4 this game is worth every penny. Addicting and enticing. New challenges including the natural disasters, crime and fire, etc. The thing that really sets the game apart is the fluidity of it. Everything progresses so smoothly! The quests are probably one of the best parts. You easily carry along the game with features you need to learn in order for your city to thrive. The wait times are short, the fun is long, and the game doesn’t stop providing. Worth every penny! The only suggestion I would provide is that when zooming, the quality be a little better. Other than that small reason which hardly affects you, this game works on all devices (iPhone XS currently) and provides the best experience possible. Get this game for hours upon hours on fun. Finally, a game I can enjoy without being constantly bombarded with ads to watch videos or purchase in game money to advance. Also, no waiting for real time hours and days for items you build to complete. This game is very similar to the old sim city, albeit a little easier. However, I have so far only played in casual mode, and there are two harder levels available. Looking forward to building a city in hard or expert level! You can save multiple cities! The game auto saves for you or you can do your own manual save. Well worth the reasonable price tag for this game!!! I hope more developers follow suit. I love this game so much. Literally don’t have words for how long I’ve waited for a game with no ads and micro transactions. I look forward to (hopefully) more games by you. I was wondering if you were planning on adding more things to unlock and do after you reach level 100 because I made it there in a day and love my city I’ve created. I was just wondering if I should make more or if I could wait to build on my current one. That you for an amazing game! A city building game that is actually about city planning and not collecting stuff and micro transactions! FINALLY a paid world builder, sim city style app! I am so sick of the IAP-style, dime-a-dozen, city games. This is amazing and just what I was looking for—I happily paid for it and it was worth every cent! Wow, I’m sad that I’m late to the party and just discovering this game now. What a delight! 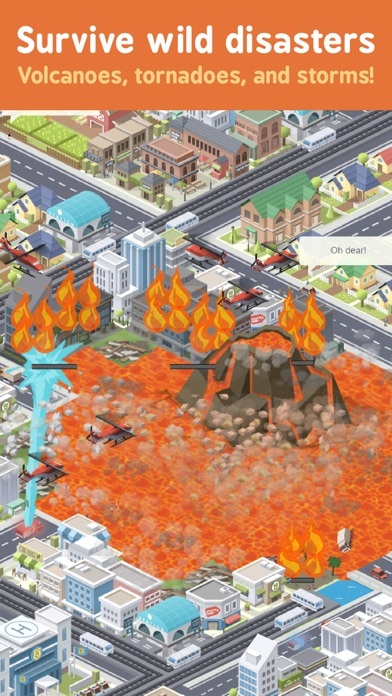 I tried to play the iOS Sim City for a while, and it was absolutely terrible. This game is just awesome. I can’t believe it’s developed why one guy. Well done! It’s just such a joy to play. Lovely graphics, easy intuitive gameplay controls, wonderful mechanics. Well done!!! There are so many of these games but this one is over the top. NO IN GAME PURCHASES that is the best thing. No wait timers and you can build and make you city how you want. It’s like city skyline but if it was compaction to mobile. Over all this is one of my favorite games out there. Biggest waste of 5 dollars you can spend, this game is repetition after repetition. A really fun and entertaining game. Wish I could give it 5 stars. But it has been crashing with alarming regularity. About half of the time I access the Quest menu, the screen flashes white and it takes me back to the main menu. Not a huge loss of time or progress, but very frustrating how consistently it has been happening. Most Amazing City Building Game! 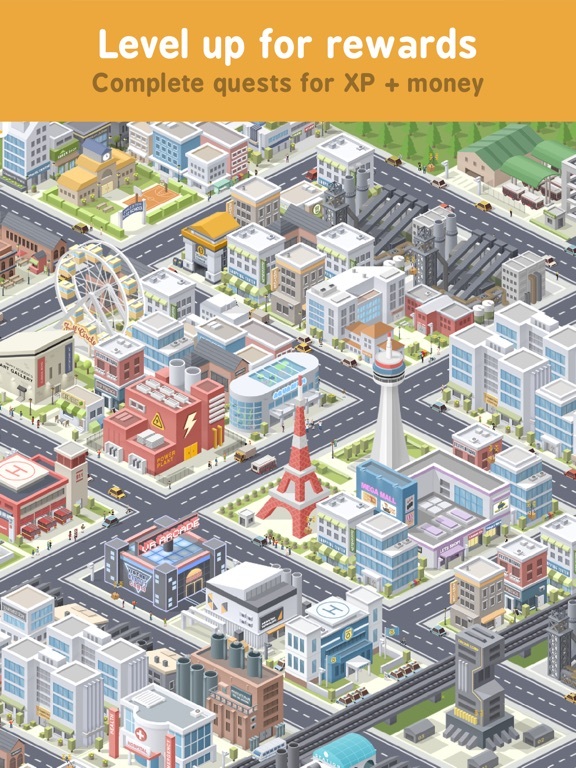 This is the best city building Game on the app store. It has great graphics and is has a great design. The natural disasters are amazing and the way the game works is so cool. Totally worth the money. After putting in 3 hours on the easiest level, I decided to try the hardest difficulty.... I really enjoyed the hard game mode, but after putting in 6 hours or so, i felt like i did everything and didn’t want to play again so i feel like the game was boring after that. Love it! Just a suggestion. I love this game. It is a game where you can genuinely have fun without having to pay to speed up wait times and such. This is just one suggestion I have-building rotation. I’m not saying like they have to be a 3D model, but I’m just saying that you can rotate the building four ways to align with the road. Amazing game! I don’t get it, I got the game based off the reviews. It’s pretty boring compared to sim city, even the sim city 3 remakes on mobile. This game has potential, but if you want an immersive experience with lots of options ,this isn’t it. You get squares to build on, that’s it. Should be a free game with ads, not worth it. Reminds me so much of Sim City! Really good and entertaining I like the leveling up aspect in the game. I hope the maps can get a bit bigger. Cuz oh wow the worlds fill up fast. Any way. Great work on the game! This game is the complete package wether you’re serious about managing a city or you just messing want around in sandbox mode and cause disasters! One thing that would be cool to have is more types of disasters like Sand Storms, Blizzards, Zombie Apocalypse or even Godzilla would be epic. If you’ve been lusting for something like SimCity 4, this is it. This is by far one of my favorite city-building games available on the AppStore. The “easy to pick-up and play” style of gameplay is great, and the artwork and simple music make this game one of the lesser-known games that everyone should be getting. And for the modest price tag, but NO in-app purchases, that goes with it, this game is one all city-building game fans should be taking note of and giving a run through. One thing I will say about this game is that it runs HOT on devices that run the game at high resolutions and the battery drain is real with this one. However, I believe that with future improvements to this game and further optimizations to make this game run even better with new content (hopefully) being released, this game will go down as being one of the best underrated city-building games available on the AppStore. Definitely give this game a whirl! Best mobile city builder game I’ve played yet. No micro transactions, decent humor, and it’s incredibly fun to play. There are a lot of hours you can get out of this game and it’s totally worth the $3.99 price. Worth the money! No in-app purchases, amazing gameplay, and hours of fun. I am so glad I bought this. I’m honestly impressed. It’s really good I like it I recommend it’ll anyone that’s thinking bout getting it it’s better then the crap game of simcity and for 3 bucks I give it a 5 star totally worth it I think you guys should add better land it be awesome love the game. While I enjoyed the game for a few hours, I reached the end of the road too quickly, and the lack of variety was disappointing. Before I delve into the many shortcomings of the game, it must first be commended for how easy it is to build an entire virtual city. The only constraint is your own economy. The game feels really good after level 30 (when you can upgrade the zones) but it feels close to being over at that point. On to the negative critiques: -Not enough content: only a handful of buildings to choose from and they don’t have much player interaction aside from a few of them unlocking events. -After you set up the economy of the city, and you buy all the land, there’s not much use for money and you still get small sums of money for leveling up: Need a meaningful money sink and better level up rewards. -Need more power in deciding what kind of building is produced when designating a zone: I like the way certain buildings look facing certain ways, so it would be nice to manually choose what kind of building is generated instead of relying on rng/an internal algorithm. 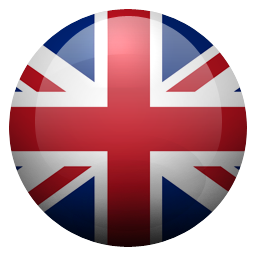 -Need achievements: simple parameters to guide an experience can add fun and value. -Building roads gives too much xp: I can just spam build roads and that’s the best way to get xp after a decent economy is created. Side question: how does the public transportation work? I thought I connected the industrial and commercial zones with sky rail but that quest never finished. All in all, I like the game, but the replay value is severely lacking. I love that this game is straight to the point with what you have to do. And there are no pointless missions or quests to do. Very fun to play and make a little city whenever I’m bored. 5/5 !!! it’s honestly so refreshing to play a progressive game like this without micro transactions. definitely recommend if you enjoy these types of games, worth the money. This is a great game! Not having to deal with ad’s, micro transactions, or cool downs is really a game changer. The one thing I can’t figure out is how to rotate my buildings so that they actually face the street. If it’s not a current feature, please add it! If it is hopefully one day I’ll figure it out, lol. Is doing what EA and SimCity SHOUKD BE DOING. this game is a throw back to the old SNES SimCity and it’s glorious. I love how relaxing and fun it is, not to mention it’s not like any other city builder games with a lot of micro transactions and waiting hours for something to get built. But overall it’s just a great game and I recommend it to anybody. The game is fun, but I ran out of space to build literally 2 days in. Idk. This game is amazing. There is literally nothing that more fun. Would like to see an option for landscape mode. Do I jump into sandbox mode and I start to build my city. I build my residential and fire department and then a fire breaks out and the alert says “sorry we have no fire department” and I’m like “but it’s right there one square over.” I hate when games are this dumb. This game is a delight to play and is priced right! I love the lack of micro transactions and ads. Things progress at just the right pace, and has me entertained for quick sessions as well as longer ones. My only two criticisms are that it can be a battery drain, but thankfully has options to mitigate that, and that the cloud upload feature doesn't seem to work. If you are looking for a fun city builder that isn’t too complex, grab this game, it’s great! This is essentially sim city 2000 for iphone, what the EA game should have been. If you played sim city back in the day on PC, and are looking for the same experience on your iphone, this is it. Even the humor is the same. Would like to see more building types/variation that mirrors the part of town buildings are in. I remember this from the og sim city. For example dilapidated homes in the bad part of town vs nicer looking homes in the affluent part of town. Nothing else i could say that hasn't already been mentioned in other reviews. Go buy now! But hate micro transactions, you like this game! I was okay with this game, it’s a cheap facsimile of Sim City 2000, but okay, I can deal with that. But then I got to the point where I’m starting to build rail lines, and the rail stations 1) need to be connected to a road to work, and 2) don’t count as access for the developed parcels. So even though a transit station is immediately adjacent to a property, it’s still vacant due to lack of access. “Hi! My name is...” quest is glitchy. I change the name, and the app locks up. Does not give credit for the quest completion. Please fix and I will change rating. It’s so much fun I like the game a lot! No matter how many power plants I build it’s load never reduces. I paid money for this and wish a refund! I like this game. I can actually build a whole city without having to spend more money. I can go two days without playing it and it doesn't harass me with notifications. It's just available when I need it. I don't have to concentrate too hard to play it either; I can just let my mind relax which is helpful to my anxiety. I just wish, now that I've had it for awhile, that there were some new things. Maybe make the stores specific, instead of just "community" areas, maybe specify that they need a grocery store, electronics store, clothing store, etc. Instead of just one school, maybe divide it into two buildings, elementary and secondary. Maybe a library? Museum? Race track? Ice cream parlor? I am not one to review games very often, but this game has caught my eye. Like many others, I have been looking for a mobile SimCity like game that didn’t swallow my hard earned cash through IAP, and then pocket city showed up in my recommend. This may be the best $4 I have ever spent on a mobile game. Gameplay is extremely smooth and easy to understand. There is not grinding, waiting, or paying like any similar city builder on mobile. That in my book is almost worth $4. My only major complaints are that: 1. The lag. The lag is horrible (Granted I am using an older phone). And 2: I really would like a much larger map or more complex gameplay, like different zone types, like In older sim city games. However as it stands, I don’t think it is easy to find a similar experience with a city builder on mobile, and this is a must have for classic sim city fans looking to get their fix, without getting ripped off by EA. This app was pretty fun! I was obsessed with it for a few weeks, but eventually it became pretty boring. I would recommend to the creators to add more things to do as you move up levels, after a while the game gets boring and it would be fun to have more things to do. Years... lifetimes... all spent wandering through a desert filled with micro transactions, abrasive advertisements, poor game systems, rip offs, the uninspired attempts... the soulless wasteland that is City-Building on the go... We have finally arrived. This is the promised land. 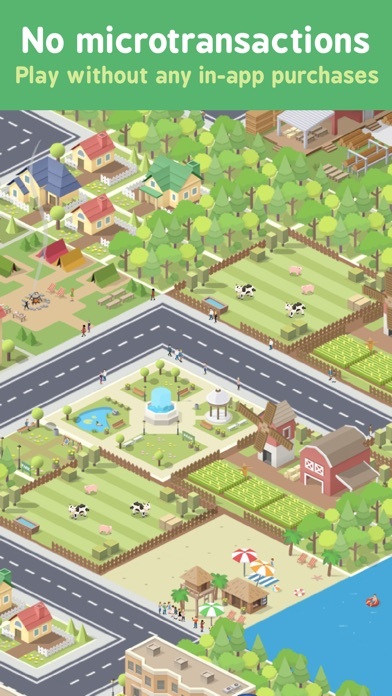 We, iOS’ chosen people can finally rest, relax, and enjoy an amazing city-builder and management game. With all the depth you’d expect out of a (good) SimCity game, and enough personality to stand on its own in a vacuum, Pocket City is an absolute must. You pay ONCE and get everything! No in app purchases! No long build waits! No waiting for Gems or stars in order to build things. I can play however long I feel like playing without having to wait several hours to build resources. The price is very reasonable and the gameplay is addicting! Well worth the time and money! So much fun I almost lost my job! Thank you. Great dev. Would love to see more buildings added as there isn’t much to build once you get going. Pocket build adds content at a faster pace, but this is still a great app. My 7 year old nephew loves it. I’ve been looking for a builder that simply let you build, and this is it! You can play the game and open buildings and services as you go, or sandbox mode and have instant access to everything. There are no additional purchases, and the building take literal seconds to build. No waiting three hours to make a nail so you can wait eight hours to build a board and then 36,000 hours for the house to build! It’s truly wonderful, thank you for that, dev! Having said that, the build menu takes up entirely too much space on the screen, I think. I would prefer to play in landscape, but the menu covers more than half my screen and I can’t really see where I want to build. It’s slightly better in portrait, so portrait is where I stay. But that’s a personal opinion, overall this is a fantastic game and I feel like the cost of the app is incredibly reasonable. This is what SimCity should have been. Fantastic city builder good for a few minutes or a few hours. I like the leveling system which keeps you from getting ahead of yourself and gives you specific goals to work toward. And _NO_ IAP! Thank you so much for an honest, premium game! Lots of little touches to keep it from being a mere clone with a quirky sense of humor. There’s even a sandbox mode. Hard to believe this game comes from a one-man studio. At launch there are still a few problems. The graphics are a bit soft as you zoom in, even at highest settings. Not so much as to be a bother, but you notice it. I’ve had two crashes but no data loss, so not a big deal. Have had an issue with power plants not plugging into the grid properly when incorporating highways into my city design (you still need normal roads, but the game doesn’t always register the connection even then.) This dev has been actively engaged with his user base, so I feel certain these very minor bumps will get ironed out. Don’t let it worry you — this game is worth way more than the asking price. If you like city builders (and old school SimCity in particular) then you need to own this game. NO MICRO TRANSACTIONS? Take notes EA. After Sim City was completely sabotaged and destroyed by EA, and the original non micro transaction version of Sim City was pulled from the mobile market, we desperately needed a classic city builder that went back to its roots. 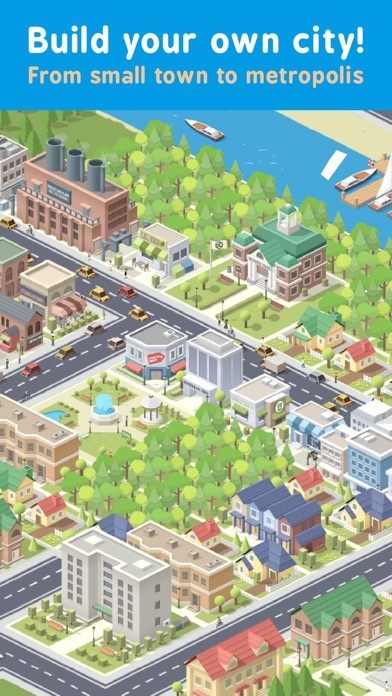 A sim that wasn’t about having to wait for cool downs, or having to pay to get building materials... we wanted a game that was about city management, rather then micro transactions. Not only is this a fantastic city building game, the design, UI, building mechanics are all well made and very well thought out. You can tell this was made from the heart of its developers. Something that EA doesn’t care about. I honestly didn’t hesitate to purchase this game when I saw the review online. I will always give my money to game studios that care about what they do and want to make a great game, designing it around fun and functionality, rather then a greedy corporation that specifically designs its game mechanicals to get the most money from you. I have not and never will again give EA another cent of my money. Take notes EA. I just want to thank the developers for giving gamers what they really want. We notice. The developers of this game did it right. Instead of the typical cash-grab model that the "free" city-building sim games use, this game relies on the straightforward practice of charging you upfront for the game, but then they never hassle you again for money. No in-game IAPs (no paid currencies, no paid speed-up options…nothing). The game itself is really fun and they’ve tried to differentiate it from the other city-building sims. You can really play however you want, but they give you quests to work on if you want to pursue more objectives instead of working in a sandbox. No matter how you play it, I think you’ll find it to be a lot of fun. The only thing that I find to be limiting about the game is that there isn’t a whole lot of space for expansion. I hope they give us more room to work with in future updates, but even as it is, there is enough space to build a decent-sized city. Aside from the limits to city expansion, I have found that there is plenty of content to the game. This game is well worth the price if you’re a SimCity fan. A fantastic bite-sized Cities: Skylines scaled down just enough to be fun on mobile without losing too much. It’s quick to start, making it nice to play if you’ve got a couple of spare minutes here and there and not overly simple for if you want to play for a longer period of time. It’s incredibly refreshing to see not one single ad or IAP. So many city builders have a premium currency and/or mandatory extended wait times for buildings to finish that it makes you feel like you’re playing the game on a schedule built by the developer. It’s good to see a city builder throw away the Sim City mold and let the player do as they will on their time and not beg them to connect to Facebook while they’re at it. There are some things that could be fine-tuned, like making it so buildings orient to face the roads but those are incredibly minor flaws. I’m hoping to see new additions to the game or possible challenges to keep things fresh, but as a whole the game is beautiful and absolutely worth the price. 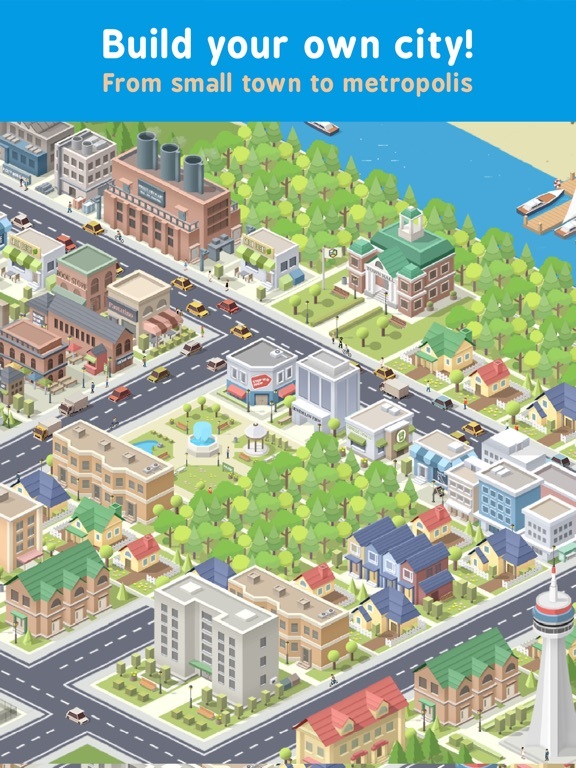 This app is what a city building game should be. I played SimCity perhaps 20 years ago when in my 20’s, and learned a lot with it. Now, I wanted my child to have a similar experience. This is the only city building game I could find in the AppStore that delivers that experience without the cancer of InApp Purchase. A child should be able to play a game, and learn from it, without being routinely, intentionally, maliciously frustrated, for the sole purpose of getting dollar after dollar after dollar tricked out of his or her parents. 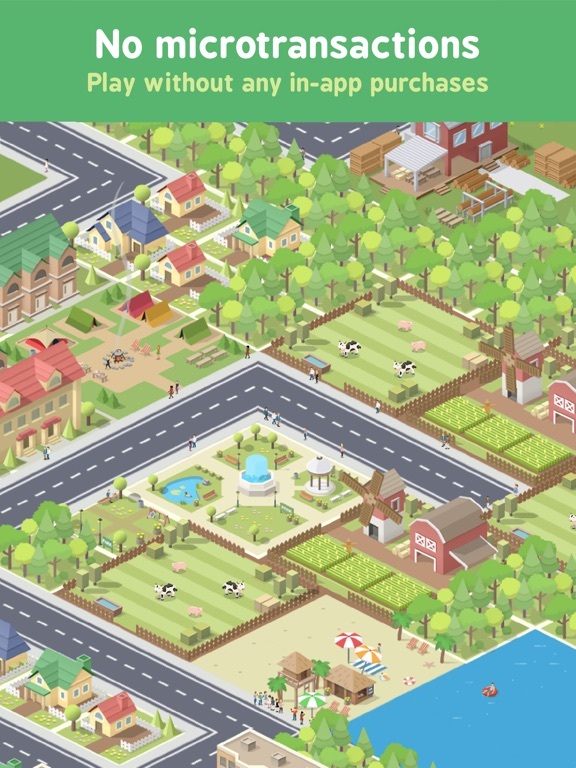 This city building app is just as feature rich and thoughtful as the version of SimCity I used to play (I believe it was SimCity 2000), and it is everything that the current version of SimCity for iOS is not. When searching the AppStore for city building Apps, as far as I am concerned, this App should be at the top of the list, if not the only one on the list, with all the others banned as the ripoff-schemes they are. Hey EA, take some notes! PocketCity is a fantastic game. I must give the developers props for not going the freemium route, because that would have destroyed a beautiful game. The game reminds me a lot of the early Sim City games, but with a lot more optimized changes for the better. The game is entirely played in portrait mode, which I found to be a super convenient option. No need to flip my phone around, just casual gameplay. Some big differences between PocketCity and SimCity that I’ve noticed so far: +As long as your buildings are connected to a road, they will be supplied with electricity AND water. So no more need for a sewage system or power lines. + Zones undergo construction immediately and dynamically take up space depending on how big the block is. + Buildings are unlocked via leveling up your city and completing quests. PocketCity is a breath of fresh air in a mobile market saturated with disgusting freemium garbage. Perhaps one of PocketCity’s best features is the sandbox mode, allowing players complete freedom over their currency and creativity. I’m eager to see how players will use their freedoms to evolve their little pocket cities into amazing and creative utopias! Thank you, developers for a truly wonderful premium experience. I will be recommending this game to all my friends and family, possibly even gifting it to them. I recommend this game for anyone looking for a truly premium city building experience that celebrates creativity! When I downloaded SimCity, I was hooked. The only downside was that it clearly wanted you to pay. “Not enough materials!” “Would you like to speed up the production time?” “Special Offer just for you!” Are some things that made it clear it was a game about paying. But this game is different than that SimCity garbage. The No In-App purchases is amazing. It moves quickly, no waiting for materials, and it takes some of the good stuff from SimCity, like Pollution Areas, Firefighters, Police, and more! If you like SimCity but don’t wanna sink all of your savings into it, get this game. Spending 4 bucks on a game better than a free one you have to spend 20 on In-App Purchases just to make the game fun, I think is worth it. But who am I to judge? Try it for yourself! It’s only $4! (P.S. sorry for the long review, but I’m trying to make a point about how good the game is.) But after all... that’s just an opinion. A GAME OPINION. Thanks for reading. This is fantastic game, easy to play, and entertaining. I highly recommend it. The only reason I give it four stars is cause it does need a couple, hopefully easy, improvements. The expert level is next to impossible because it there is not enough city management information to make small changes. There is a counter for how many houses there are available, but no counter for jobs. So, if your city is lacking jobs, you don’t know how many commercial or how many industrial locations to add. It is easy to over add and then hemmorage money in zone maintenance costs. Likewise, there is no information on the cost of zone management per zone, nor any information on how much the police, fire, or leasure services cost. Without this information small changes in the hard or expert levels really throw off the decision making process. Add this information and I will give the game six stars if I could. 5 stars hands down. This app is so worth it. It’s very immersive and rewarding. I love not having to wait days for things and not having micro transactions. What I would love for this game, (other than things like more content, themed buildings, etc. as mentioned by others), is: 1. Take off the rebuild all option after a disaster on expert mode. This game would be a lot more challenging if you had to remember and rebuild by hand what was destroyed. (But maybe still gain money/XP for it). 2. Have a few more variables for taxes/gaining money. While trying to raise money in the beginning can be really tough, there’s not a whole lot to look out for other than changing taxes from high to low and exporting resources. 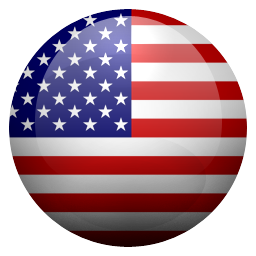 Some possible ideas could be: tourist income, stocks, more tax options, etc. 3. More hazards would be cool. Not just disasters, but maybe car crashes destroy buildings. Or the busiest roads wear out and are unusable until replaced. Overall though the game is still really fun. One final thing I want to mention is that if you offered all this stuff plus bonus content as a big DLC for a buck or two, I wouldn’t mind paying. Obviously game development takes a lot of work and with all these requests from different people it’s sure to eat away well passed what you’ve earned already. This is the mobile city building game I have wanted for so long. Also generally sets the bar for what I look for in a good mobile game altogether. Easy to jump right into and get going quickly, easy to put down if you need to stop for a moment, no micro transactions, fun mini quests (price is a bit too low in my opinion). Would love to see some additional complexity as well as bigger, more interesting maps, but wow is this still amazing. Really great work from this solo developer. Hope you build either on top of this franchise with expansions or produce sequels that offer more features in the future. If you offer a more complex sequel I would definitely set the price a bit higher, I feel like I got way more than I paid for and would be willing to kick some cash your way for a kickstarter or something. This really is such a relief for mobile games in the genre. It’s surprisingly engaging, satisfying, and sometimes challenging. I’m so happy to pay a few bucks, because you get great content without the ridiculous hassle of advertising. I quite frankly don’t have complaints just some hopes for the app. I really really would love to see just further growth. More upgrading of areas (higher and varied buildings) more landmarks and sites, maybe a bigger map, and higher resolution. But that’s just the ideal version of the game, it’s wonderful as is! The dev has done a great job. Also I built an entire city filling the map, then got the mission to find the busker, where the heck is that fool?? Haha. Anyway, keep up the good work, hope that things continue to improve! This game is so realistic. I thought at first it was a little too realistic, but this game is not all that complicated, though you can control tax levels. :p. I love this game. It is so much fun. And the random disasters keep you on your toes. Plus, the random fires and crimes are awesome as well. I love the element of surprise to all of it. It is simple and fun to grow your own city, and the conversations between the little NPCs are funny to observe. TO THE DEVELOPERS: Sometimes the game crashes. This crash occurs whenever you have construction going, and you try to view a quest to either start or complete it. It is annoying, but not too bad. Plus, the FPS needs to be fixed. The frame rate is really bad sometimes, especially once your city gets big. Bad frame rate causes crashes. Pls fix this. If you haven’t played this game, DO IT! It’s a lot of fun! Although I’m having a learning curve knowing where to place power/water sources. I’m sure I’ll figure it out with time. I would LOVE it though it in sand box mode you would have the ability to have no disasters and/or maybe no need for power/water. Maybe you can toggle on and off what you want in sandbox mode? The reason I’d like this is I went into sandbox after a tornado came in and I was frustrated figuring out where the towers needed to be. I was hoping to get to relax and go back to my main later. Then I realized I wasn’t free to place things wherever without resources. Ok. That’s fine. More practice for me. Then.... just as I was placing my fourth building a frEAKING TORNADO CAME AND WRECKED THE LITTLE I HAD AND I JUST LEFT THE APP. So yeah... please help. For anyone who was disappointed in the Sim City Built It that looks and feels nothing like the true Sim City, this game is a much needed relief on the AppStore. This is close as it gets to the real thing. Currently the game is more simple then the true thing, but I hope the game continues to grow and add more buildings and features. Everything else is just as good as the real game and sometimes even better. There are quests and missions that help you level up and get more buildings while also growing the city and making it better. The best part is that it really is a once and for all payment, no micro traction’s after the fact. No waiting on loading or slow downs so far. Just sit down and binge play for hours! So thankful to finally have a city building game that isn’t destroyed by in-app purchases and pointless timers/resource gathering. Most city building games on the App Store I have to put down cause I run out of energy, need a material that I have to wait to farm or something else that is totally pointless and put into the game to force you to spend money. The only reason I have had to put down this game so far is cause I have to go to work and sleep. Seriously though, there is nothing to keep you from playing this game for as long as you want in a single session and I LOVE that! Has a great tutorial for people new to this style of game. UI is clean and helpful. Easy to navigate. Portrait and landscape modes available. Music is great. Love the save options for multiple cities. It’s very polished. I have been part of the beta and have seen many improvements come out. It’s obvious this developer cares about the app and the experience we have playing the game. If you like city building games, I guarantee you won’t find something better. Thank you to the developer for all the hard work you have put into creating this game!! Bought this game based on reviews and descriptions, but did not get anywhere near my moneys worth. The game is short. I finished the game in 3 hours. I maxed out the upgrades and filled the map expected the map to sheet bigger after I bought all the land but it doesn’t. The map area is TINY even when set to “large”. You have no room to create to your hearts content. You can’t build suburbs around a metropolis because there is no room. The game kept telling me I needed more commercial zones but I had no room to build anymore. The game is like the early sim city games based on zones but it would be nice to have more control over the population densities and whether it’s a small town feel or a city full of skyscrapers. While the graphics are enjoyable and the natural disasters add a fun twist, the game is seriously not worth 4 dollars and I feel ripped off after seeing that the game is maxed out and you get bored after a day. Sorry, my mistake, this game IS great! - Won’t rotate on iPad Pro. I take back my complaint about not rotating. After looking closer (and seeing a Pocket Tactics article on the game) there is an option to change between portrait and landscape in settings. A bit unconventional but it works for me. Now having played a bit I will agree this is a great, great game. Spiritual successor to the great city builders. Retracted review: Looks like a great game but I can’t get it to rotate to play normally (landscape) on iPad Pro. Starts out okay but instantly spins 90 degrees and becomes essentially unplayable. I hope this is fixed because this isn’t a “phone game” in my opinion and I don’t plan on taking my iPad out of its stand and off my desk to play one game that really looks like a landscape game. In a world of In-app purchases, pay to unlock, pay to speed up and arbitrary gems and coins, it’s SO nice to have found a fun, casual, well-paced city building game without all the paywall nonsense. I started the game last night and smoothly progressed through 50 levels without growing frustrated or having to wait 6 hours for a building to be built. Don’t let the fun and simple graphics fool you, there’s a deep layer of controls in place akin to Sim City. You control your taxes, toggle maps to see where you need to improve, land management functions, etc. The quests keep things interesting while not intrusively forcing you to complete them. An all around fun game to play for 5 minutes or 5 hours. Get it. Good game but could be better. This is the best city building game out there that does not require waiting or in app purchases. That alone makes the game good and worth getting. You then add in the quests, events, and other cool unique things in the game like looking for a person doing yoga. Lol. It becomes really fun. With that being said. I knew what the graphics looked like when I got it but really wish they would be a little better and actually 3d. Allowing you to zoom in and out and rotate the city. I also would like to see being able to select different building types. ie different themes of residential buildings. I still have no regrets getting the game and think its worth it. Hopefully the developers continue to add new content and grow the game. Great game could use some more efforts in animation but style and gameplay is very good. Thought more buildings and a much bigger area to build a city. Also maybe add in a way to rotate certain buildings. Also money feels way to easy to make and the progress of the game is a bit fast. Maybe make certain things take more time. Other than that wonder building game. Update after a few hours of play time. Needs more land and much bigger area to build a city much much bigger. But other than that good game. To many mini quest though. Like put 5 of these down and then bam xp. Kind of lame. Also the sky train thing is so counter active it hurts more than helps. Here’s the deal, this game (as of right now) is $3.99. You’ve gotta ask yourself, what does the world have to offer you for $3.99? A coffee? A gallon of gas? Half a lunch? For $3.99 I don’t expect to much, but this game delivers more than I’d expect for a small amount of money. Will you find yourself playing this for weeks on end? Probably not. Will you never get bored of this game? You probably will. But, for at least a few days, this game keeps you engaged and wanting more and more. I played for hours and hours day one followed by an hour or so everyday for the first week. Now I just check in and do this and that as for the most part I’ve “beat” the game. This game doesn’t ask you to spend more money via micro transactions time and time again. For $3.99 it gives you everything it’s got. If you’re flipping through these reviews over and over again trying to decide if this is worth the $3.99 they are asking for like I did before finally pulling the trigger. Go ahead and do yourself a favor, stop wasting your time thinking about it and buy it. It’s worth it. I love this game and was instantly hooked on it. It was well worth the money as well simplify for the fact that there are no in app purchases or annoying ads. How ever the only reason why it isn’t a 5/5 for me is because the to me it seems like the map is too small. If you are like me and bored for a day and spend a couple hours playing this you will have the entire map filled up pretty quickly and have no more room to build locations which haven’t been unlocked yet. I also feel like there could be a bigger variety of buildings to make. There is enough for the game to be worth the money already and I may be too critical but, I feel a map expansion and more buildings would really go a long way. From the moment I downloaded till I went to sleep I didn’t stop playing. I reached level 89 and I was mostly done. I love this game, however if you let me complain a bit, I would like the space to be a bit more bigger. I know in SimCity it had this type of map too but I wish it could get bigger. I want to have more population, I also want to grant the demands for more commercial areas or industrials, but I can’t just demolish what I have built. Another thing is the money, I love getting a lot of money but it gets to a point that I don’t have anything to use it on, and I just keep getting more money. Apart from that, I really love the game. I have recommended to everyone I know. Classic City Builder With No IAP and No Timers!!! Finally, a city builder on iPad with no IAP or timers! This is an homage to the classic city-building games so many of us grew up with and loved. My first impressions are very positive. Gameplay has been streamlined a bit for mobile and it’s perhaps not as deep as some city builders on PC (no separate infrastructure for power lines and water pipes for instance) but I can live with that because the city-building experience is spot on! The aesthetic feels current and deliberate, opting for a modern “flat graphic” style instead of going with something more like the games of the past that would end up feeling more dated today. Also, the game DOES support landscape orientation but you have to enable that from the settings menu. I also appreciate the ability to customize performance to reduce battery usage and improve performance on older devices. It’s clear the developers love the genre and have put a lot of thought and care into the title. I bought this on pre-order because I wanted to support developers who believed in premium apps with no IAP or timers. I’m recommending it because it’s fun and scratches my city-building itch very nicely. I’ve been playing this game since it was released, and so far, it has been very fun. There is so much to do, and so many ways to make your city look special. The gameplay is diverse and addicting, but there are a few flaws that I have taken note of. First of all, the income comes in so fast that you almost never have to worry about money. Some may think that this is a good thing, but I am worried that it will make the game boring after a few days of gameplay. Secondly, the rate at which your city grows is extremely fast. One way that this can be fixed is by making the construction time longer on buildings or by making the income slower. Overall, it has been a blast and I can’t wait to see what is to come. Great game, simple. One extreme issue. Huge issue with the game heating up my iPad while playing, a few minutes pass where the heat becomes noticeable. Can you fix that? So far I have gotten to where I can use the extra zone textiles. I hope there will be more added to this game, it is lacking some of the variety of structure in building a city, also be having to figure out how you set up sections of highway since power or water does not run with it. It is alright since it doesn’t have ads and no iap. But I can tell that you might spend time to make a city if you are a beginner, but you tend to get the ball rolling fast if you had to deal with sim city build it for a while. So I hope they add more to it. 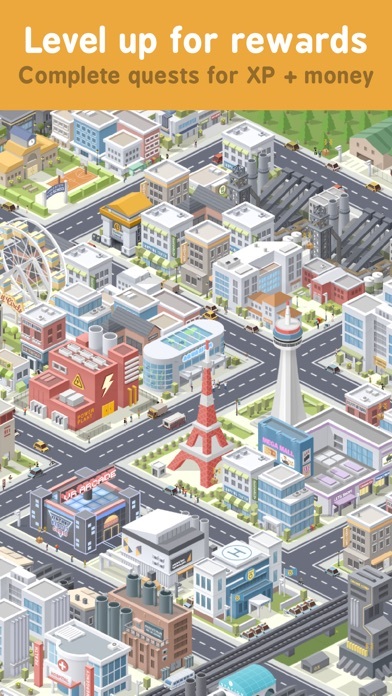 An excellent city simulator that harkens back to the days of SimCity. And the buy-once model is a refreshing change (no in app purchases! Thank you!). That being said, the game gets boring after you’ve built on all available land. The tasks slow down substantially after level 80 or so and you’re stuck waiting around for new tasks. Most of which are boring (hunt around for a character doing a certain thing). The gameplay also grows stagnant. Why don’t zones get continuously denser as population increases and land gets scarce? Where is the feedback on how well our mass transit is doing (not just a map of traffic… let’s see hard numbers on how man riders etc). The game quickly becomes a matter of just balancing the budget (but sometimes there’s nothing you can really do but raise taxes and chase off a third of your population). The budget is very much feast or famine… either you’ll be raking in huge piles of cash (and have nothing to spend it on), or losing it all rapidly. All in all a fun game but the developer needs to work on making the game more robust as the levels increase. Currently it’s superficially fun but that wears off rather fast. I was really excited about this game with all the great reviews. If I’m wrong correct me but so far I haven’t found a way to move things around without having to totally destroy them...which is annoying and kind of makes me not want to play it. I feel like I spent 4 dollars on a game that is extremely limited and I’d like to be able to personalize it more. I’m going to keep the game on my phone and try to be open minded and maybe hope for an update that fixes this. Just add a way to move things and a way to be more creative while playing and I’ll be super happy and I bet more people will love this game and download it. The idea is good and I like it just wish there was more room for creativity it’s a bit too cut and dry. I bought this game based off the reviews and I have to say for the price I expected a little more. The game feels very incomplete, unable to control the actual buildings you put in. You just define a zone as residential or commercial or industrial and the games throws in some nice looking buildings and some super ugly buildings. I’m also amazed that there is no rotation of the map, that or I have been unsuccessful and finding out how to rotate the map. Speaking of rotating you also cannot rotate buildings you just build them... I’d advise anyone who like city building games to save their money, this one is not worth it. As for my title of limited upgrades I am disappointed that you can’t upgrade residential buildings to skyscrapers. I like creating zones, having a “city” with downtown area and then a suburb or even a rural area... maybe updates will come but I’m not holding my breath. Welp I’m just gonna day I don’t review often, but this game amazed me. I love the extremely short build times that allows you to grow your city to a decent sized metropolis in just one afternoon. I was reluctant to buy it because it was 2 dollars, but playing I could see it being more. The overall premise is simple that allows you to get the game, spend maybe 5 minutes learning the tutorial, and then take that and grow it exponentially. I’ve had the game for maybe 3 days now and I’ve almost maxed out my first city. If you are reading this and you have an extra 2$ ( don’t know why you wouldn’t) I highly recommend this game. 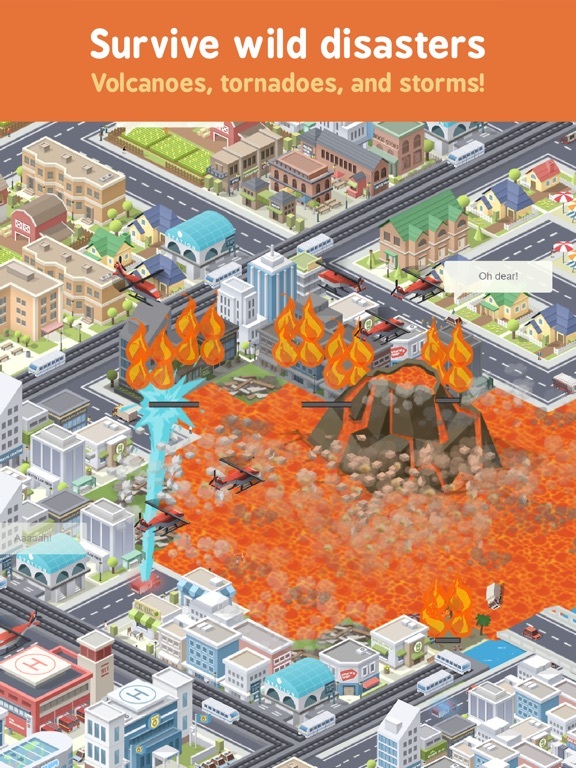 Pocket City is a great city building game, taking aspects from the PC version of Sim City. Although the game costs $5, it’s worth it, due to leaving out in-app purchases, something that has ruined much of the genre by making it pay to play. The only thing I would complain about is the repetitiveness. The gameplay, even when not on sandbox mode, tends to get very repetitive and somewhat boring. 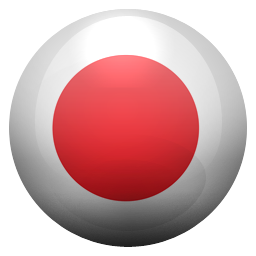 You quickly reach a point of making thousands a second, making money, little of an issue and leveling up is fairly easy. Although it has these issues, the game is a true interpretation of what a city building game should be and has potential to become an even better game. well I want to start off by saying this game is very fun but I have the same issue with this game as I did with rebuild 3 and that is that it gets boring fast, too fast. I know games deteriorate in enjoyability after a while but I’ve only had it for about a week and this game costed money! the leveling system is well done and feels nice and that’s what I praise most about this game, which should be saying a lot. the worst thing about this game is the random disasters, now I like this feature so things remain interesting but when stuff gets destroyed you should be able to tell what got destroyed so you can easily replace it and move on. I shouldn’t have to memorize my whole city’s tile set to prepare for disasters 24/7. this game is good, but so much more can be done and I expect a lot more from a building game in 2018. Bought this because it app of the day. It is hopelessly broken. If you play on hard, once you get to level 27, money stops. No matter what you do, no more money. Well, except for endless fireworks displays. Since the fireworks display event is also broken, you can keep hitting it repeatedly to level up and many levels give you more money. Casual level is just a battery drainer. It’s not that it’s too easy, it’s that there is no challenge at all. Just watch the city grow. Hard is broken, but at least it was challenging until level 27. Pass on this one. UPDATE: Yes, as pointed out, the income stopped because my town hall was destroyed. My fault for not noticing. The notice could be a bit bigger but other than that, once I built it back, things started working again. There is still a bug with the fireworks though. If you don’t have a townhall, you can put on as many fireworks shows as you want. This get you experience points and at some levels, you get cash when your city levels up. All in all it is not a bad game. I DO LOVE that there are no micro transactions, thank you.